Everybody talks about emotional intelligence, it seems; educators, organizational science experts, self-help and self-growth gurus all speak of the ability to identify emotions, use them in problem-solving, decode complex emotional reactions and regulate emotion to guide internal and external behavior. Is emotional intelligence really the big answer to all those big questions that went unanswered for so long? Despite the promise this budding concept holds, there is danger in overusing, abusing and overgeneralizing our insights in a field still marred by misconceptions, popular notions (that are not necessarily supported by evidence) and misguided perceptions. What people need to promote their knowledge of EI (and how to apply it) is a good theory or model to guide people’s understanding of what is known, and to help design and pose questions to keep exploring and develop our knowledge base. This is exactly what this book attempts. Focusing on the potential role of emotional intelligence within a field that, until recently, was left underexplored by social scientists: health. Despite ample evidence suggesting emotional intelligence can be a pivotal factor in understanding of effective coping with stress, well-being, psychological resilience and health, only a handful of empirical studies examined if and how emotional intelligence is associated with health outcomes. This book takes a good look at the emotion-health association across time, culture and scientific approaches, while reviewing what is known about the potential of EI to account for a broad range of health outcomes. Based on what academics know, or more importantly perhaps what they still do not know, a theoretical model of emotional intelligence and health is presented, and possibilities are presented, including directions for interpretation of current evidence for asking new questions to broaden our understanding and ability to use the concept to explain varying health conditions. 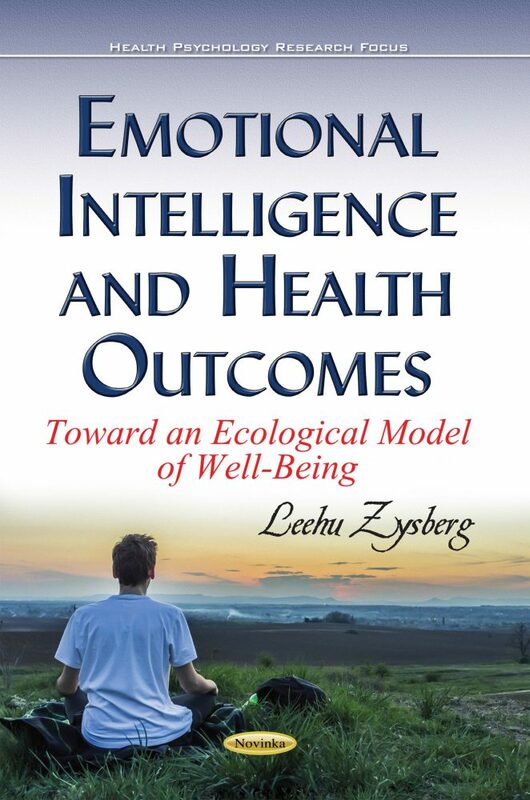 Such efforts may lead to the design of screening and intervention procedures, while suggesting how emotional intelligence can work not only within the boundaries of the individual, but also within a socio-ecology of factors that shape, among other things – human health. Chapter 7. One Step Beyond the Individual: Can There be an Environment or Ecology of Emotional Intelligence? Abraham, R. (1999). Emotional intelligence in organizations: A conceptualization. Genetic, Social, and General Psychology Monographs, 125(2), 209. ‏American Diabetes Association. (2015). Standards of medical care in diabetes—2015 abridged for primary care providers. Clinical Diabetes, 33(2), 97-111. Andrei, F., Mancini, G., Trombini, E., Baldaro, B., & Russo, P. M. (2014). Testing the incremental validity of Trait Emotional Intelligence: Evidence from an Italian sample of adolescents. Personality and Individual Differences, 64, 24-29. Archer, D., & Akert, R. M. (1977). Words and everything else: Verbal and nonverbal cues in social interpretation. Journal of personality and social. Armstrong, A. R., Galligan, R. F., & Critchley, C. R. (2011). Emotional intelligence and psychological resilience to negative life events. Personality and Individual Differences, 51(3), 331-336. Bar-On, R. (2004). The Bar-On Emotional Quotient Inventory (EQ-i): Rationale, description and summary of psychometric properties. Bar-On, R., Tranel, D., Denburg, N. L., & Bechara, A. (2004). Emotional and social intelligence. Social neuroscience: key readings, 223. Baumeister, R. F., Dale, K., & Sommer, K. L. (1998). Freudian defense mechanisms and empirical findings in modern social psychology: Reaction formation, projection, displacement, undoing, isolation, sublimation, and denial. Journal of Personality, 66(6), 1081-1124. Boyatzis, R. E., & Van Oosten, E. (2003). A leadership imperative: Building the emotionally intelligent organization. Ivey Business Journal, 67(3), 1-5. Brackett, M. A., Rivers, S. E., & Salovey, P. (2011). Emotional intelligence: Implications for personal, social, academic, and workplace success. Social and Personality Psychology Compass, 5(1), 88-103. Brown, R. F., & Schutte, N. S. (2006). Direct and indirect relationships between emotional intelligence and subjective fatigue in university students. Journal of Psychosomatic Research, 60(6), 585-593. Brown, S. L., Nesse, R. M., Vinokur, A. D., & Smith, D. M. (2003). Providing social support may be more beneficial than receiving it results from a prospective study of mortality. Psychological Science, 14(4), 320-327. Bruce, R. A., & McDonough, J. R. (1969). Stress testing in screening for cardiovascular disease. Bulletin of the New York Academy of Medicine, 45(12), 1288. Cacioppo, J. T., Uchino, B. N., Crites, S. L., Snydersmith, M. A., Smith, G., Berntson, G. G., & Lang, P. J. (1992). Relationship between facial expressiveness and sympathetic activation in emotion: a critical review, with emphasis on modeling underlying mechanisms and individual differences. Journal of Personality and Social Psychology, 62(1), 110. Calhoun, L. G., & Tedeschi, R. G. (2014). Handbook of posttraumatic growth: Research and practice. Routledge. Cejudo, J. (2016). Relationship between Emotional Intelligence and mental health in School Counselors. Electronic Journal of Research in Educational Psychology, 14(38), 131-153. Chodoff, P. et al. (1982). Hysteria. New York, NY: John Wiley & Sons. Cohen, S., Janicki-Deverts, D., Doyle, W. J., Miller, G. E., Frank, E., Rabin, B. S., & Turner, R. B. (2012). Chronic stress, glucocorticoid receptor resistance, inflammation, and disease risk. Proceedings of the National Academy of Sciences, 109(16), 5995-5999. Costarelli, V., & Stamou, D. (2009). Emotional intelligence, body image and disordered eating attitudes in combat sport athletes. Journal of Exercise Science & Fitness, 7(2), 104-111. Coyne, J. C., & Anderson, B. J. (1989). The “psychosomatic family” reconsidered II: Recalling a defective model and looking ahead. Journal of Marital and Family Therapy, 15(2), 139-148. Davis, S. K., & Humphrey, N. (2012). Emotional intelligence predicts adolescent mental health beyond personality and cognitive ability. Personality and Individual Differences, 52(2), 144-149.
de Jonge, P., Alonso, J., Stein, D. J., Kiejna, A., Aguilar-Gaxiola, S., Viana, M. C., ... & Lepine, J. P. (2014). Associations between DSM-IV mental disorders and diabetes mellitus: a role for impulse control disorders and depression. Diabetologia, 57(4), 699-709. Dodge, R., Daly, A., Huyton, J., & Sanders, L. (2012). The challenge of defining wellbeing. International Journal of Wellbeing, 2(3), 222-235. Donaldson, S. I., & Grant-Vallone, E. J. (2002). Understanding self-report bias in organizational behavior research. Journal of Business and Psychology, 17(2), 245-260. Downie, R. S., Fyfe, C., & Tannahill, A. (1990). Health promotion: models and values. Druskat, V. U., Mount, G., & Sala, F. (2013). Linking emotional intelligence and performance at work: Current research evidence with individuals and groups. Psychology Press. Dube, S. R., Fairweather, D., Pearson, W. S., Felitti, V. J., Anda, R. F., & Croft, J. B. (2009). Cumulative childhood stress and autoimmune diseases in adults. Psychosomatic medicine, 71(2), 243. Edelman, C. L., Mandle, C. L., & Kudzma, E. C. (2013). Health promotion throughout the life span. Elsevier Health Sciences. Ekman, P., Friesen, W. V., O'Sullivan, M., Chan, A., Diacoyanni-Tarlatzis, I., Heider, K., & Scherer, K. (1987). Universals and cultural differences in the judgments of facial expressions of emotion. Journal of personality and social psychology, 53(4), 712. Fancher, Raymond E. (1985) (Ed.). The intelligence man: Makers of the IQ Controversy. W. W. Norton & Company: New York. Feldman, L. A. (1995). Valence focus and arousal focus: Individual differences in the structure of affective experience. Journal of personality and social psychology, 69(1), 153. Fernández-Berrocal, P., & Cabello, R. (2016). Commentary: Dimensions of emotional intelligence related to physical and mental health and to health behaviors. Frontiers in psychology, 7. Fessler, D. M., Pillsworth, E. G., & Flamson, T. J. (2004). Angry men and disgusted women: An evolutionary approach to the influence of emotions on risk taking. Organizational Behavior and Human Decision Processes, 95(1), 107-123. Fisher, E. B., Thorpe, C. T., DeVellis, B. M., & DeVellis, R. F. (2007). Healthy Coping, Negative Emotions, and Diabetes Management A Systematic Review and Appraisal. The Diabetes Educator, 33(6), 1080-1103. Folkman, S., & Lazarus, R. S. (1988). Coping as a mediator of emotion. Journal of personality and social psychology, 54(3), 466. Foresight Mental Capital and Wellbeing Project (2008). Final Project report. The Government Office for Science, London. Fortenbaugh, W. W. (2002). Aristotle on emotion: a contribution to philosophical psychology, rhetoric, poetics, politics, and ethics. Fossat, P., Bacqué-Cazenave, J., De Deurwaerdère, P., Delbecque, J. P., & Cattaert, D. (2014). Anxiety-like behavior in crayfish is controlled by serotonin. Science 344(6189), 1293–1297. Freud, A. (1992). The ego and the mechanisms of defence. Karnac Books. Friedman, H. S., & Adler, N. E. (2007). The history and background of health psychology. In H. S. Freidman & R. Cohen Silver (Eds. ), Foundations of health psychology (pp. 3–18). New York: Oxford University Press. Gauld, A. (1992). A history of hypnotism. Cambridge University Press. Gill, M. (2000) Hume's Progressive View of Human Nature. Hume Studies, 26(1), 87-108. Gottman, J. M., Katz, L. F., & Hooven, C. (1996). Parental meta-emotion philosophy and the emotional life of families: Theoretical models and preliminary data. Journal of Family Psychology, 10(3), 243. Griesemer, R. D. (1978). Emotionally triggered disease in a dermatologic practice. Psychiatric Annals, 8(8), 49-56. Grünbaum, A. (1979). Is Freudian psychoanalytic theory pseudo-scientific by Karl Popper's criterion of demarcation?. American Philosophical Quarterly, 16(2), 131-141. Harrison, A., Sullivan, S., Tchanturia, K., & Treasure, J. (2010). Emotional functioning in eating disorders: attentional bias, emotion recognition and emotion regulation. Psychological medicine, 40(11), 1887-1897. Havens, L. L. (1965). Charcot and hysteria. The Journal of Nervous and Mental Disease, 141(5), 505-516. Hileman, C. O., Longenecker, C. T., Carman, T. L., Milne, G. L., Labbato, D. E., Storer, N. J., & McComsey, G. A. (2012). Relationship between total bilirubin and endothelial function, inflammation and oxidative stress in HIV‐infected adults on stable antiretroviral therapy. HIV medicine, 13(10), 609-616. Hopkins, K. D. (1998). Educational and psychological measurement and evaluation. Allyn & Bacon. Hughes, M., & Terrell, J. B. (2011). The emotionally intelligent team: understanding and developing the behaviors of success. John Wiley & Sons. Hurst, M. W., Jenkins, C. D., & Rose, R. M. (1976). The relation of psychological stress to onset of medical illness. Annual review of medicine, 27(1), 301-312. Isen, A. M. (1987). Positive affect, cognitive processes, and social behavior. In L. Berkowitz (Ed. ), Advances in experimental social psychology (Vol. 20, pp. 203-253). New York: Academic Press. Haviland, J.M. (Ed.) (2010) Handbook of emotions (pp. 67-83). New York: Guilford Press. Karahan, T. F., & Yalçin, B. M. (2009). The effects of an emotional intelligence skills training program on anxiety, burnout and glycemic control in type 2 diabetes mellitus patients. Turkiye Klinikleri Journal of Medical Sciences, 29(1), 16-24. Kasl, S. V. (1984). Stress and health. Annual review of public health, 5(1), 319-341. Kelly, S. J., & Ismail, M. (2015). Stress and type 2 diabetes: a review of how stress contributes to the development of type 2 diabetes. Annual review of public health, 36, 441-462. Kimhi, S., Eshel, Y., Zysberg, L., & Hantman, S. (2010). Postwar winners and losers in the long run: determinants of war related stress symptoms and posttraumatic growth. Community mental health journal, 46(1), 10-19. Kivimäki, M., Leino-Arjas, P., Luukkonen, R., Riihimäi, H., Vahtera, J., & Kirjonen, J. (2002). Work stress and risk of cardiovascular mortality: prospective cohort study of industrial employees. Bmj, 325(7369), 857. Kroenke, C. H., Kubzansky, L. D., Schernhammer, E. S., Holmes, M. D., & Kawachi, I. (2006). Social networks, social support, and survival after breast cancer diagnosis. Journal of Clinical Oncology, 24(7), 1105-1111. Lazarus, R. S. (1974). Psychological stress and coping in adaptation and illness. The International journal of psychiatry in medicine, 5(4), 321-333. Lighthall, N. R., Sakaki, M., Vasunilashorn, S., Nga, L., Somayajula, S., Chen, E. Y. & Mather, M. (2012). Gender differences in reward-related decision processing under stress. Social Cognitive and Affective Neuroscience, 7(4), 476-484. Lynn, S. J., Merckelbach, H. L., Giesbrecht, T., Lilienfeld, S. O., Lemons, P., & Kloet, D. (2015). Dissociative disorders. John Wiley & Sons, Inc.
MacLean, P. D. (1993). Cerebral evolution of emotion. In M. Lewis & J. Macmurray (Eds. ), Reason and Emotion. London: D. Appleton-Century Company Incorporated. Markey, M. A., & Vander Wal, J. S. (2007). The role of emotional intelligence and negative affect in bulimic symptomatology. Comprehensive psychiatry, 48(5), 458-464. Martins, A., Ramalho, N., & Morin, E. (2010). A comprehensive meta-analysis of the relationship between emotional intelligence and health. Personality and individual differences, 49(6), 554-564. Martos, M. P., Zafra, E. L., López, F. E., & Landa, J. M. A. (2016). The Moderator Role of Perceived Emotional Intelligence in the Relationship between Sources of Stress and Mental Health in Teachers. The Spanish journal of psychology, (19), 1-10. Masters, R. S. (1992). Knowledge, knerves and know‐how: The role of explicit versus implicit knowledge in the breakdown of a complex motor skill under pressure. British journal of psychology, 83(3), 343-358. Mayer, J. D., Caruso, D. R., & Salovey, P. (1999). Emotional intelligence meets traditional standards for an intelligence. Intelligence, 27(4), 267-298. McCrae, R. R. (1982). Age differences in the use of coping mechanisms. Journal of Gerontology, 37(4), 454-460. Minuchin, S., Rosman, B., & Baker, L. (1978). Psychosomatic Families: Anorexia Nervosa in Context. Cambridge: Harvard University Press. Murphy, K. R. (2014). A critique of emotional intelligence: what are the problems and how can they be fixed?. Psychology Press. Murrell, A. (2015). Epigenetics and Disease. Epigenetics for Drug Discovery, 47. Myers, D.G. (2002) Exploring Psychology. (5th edition). Michigan: Worth Publishers. Nesse, R. M. (1990). Evolutionary explanations of emotions. Human nature, 1(3), 261-289. Norton, D. F., & Taylor, J. (Eds.). (2008). The Cambridge Companion to Hume. Cambridge, U.K.: Cambridge University Press. Petrides, K. V., & Furnham, A. (2003). Trait emotional intelligence: Behavioural validation in two studies of emotion recognition and reactivity to mood induction. European journal of personality, 17(1), 39-57. Petty, R. E., & Cacioppo, J. T. (1986). The elaboration likelihood model of persuasion. In Communication and persuasion (pp. 1-24). Springer New York. Pines, A. M., & Keinan, G. (2005). Stress and burnout: The significant difference. Personality and individual differences, 39(3), 625-635. Plessow, F., Fischer, R., Kirschbaum, C., & Goschke, T. (2011). Inflexibly focused under stress: acute psychosocial stress increases shielding of action goals at the expense of reduced cognitive flexibility with increasing time lag to the stressor. Journal of cognitive neuroscience, 23(11), 3218-3227. Ramirez, A. J., Craig, T. K., Watson, J. P., Fentiman, I. S., North, W. R., & Rubens, R. D. (1989). Stress and relapse of breast cancer. Bmj, 298(6669), 291-293. Regel, S., & Joseph, S. (2010). Post-traumatic stress. OUP Oxford. Reiche, E. M. V., Nunes, S. O. V., & Morimoto, H. K. (2004). Stress, depression, the immune system, and cancer. The lancet oncology, 5(10), 617-625. Rigby, K. E. N. (2000). Effects of peer victimization in schools and perceived social support on adolescent well-being. Journal of adolescence, 23(1), 57-68. Roberts, B. W., & Mroczek, D. (2008). Personality trait change in adulthood. Current directions in psychological science, 17(1), 31-35. Rose, R. (2000). How much does social capital add to individual health?. Social science & medicine, 51(9), 1421-1435. Rosenman, R. H., Brand, R. J., Jenkins, C. D., Friedman, M., Straus, R., & Wurm, M. (1975). Coronary heart disease in the Western Collaborative Group Study: Final follow-up experience of 8 1/2 years. JAMA, 233(8), 872-877. Ruiz-Aranda, D., Castillo, R., Salguero, J. M., Cabello, R., Fernández-Berrocal, P., & Balluerka, N. (2012). Short-and midterm effects of emotional intelligence training on adolescent mental health. Journal of Adolescent Health, 51(5), 462-467. Samar, A. D. (2001). The relationship among emotional intelligence, self-management and glycemic control in individuals with type 1 diabetes. (A Doctoral Dissertation). Retrieved from, Umass, Amherst. Sánchez-Álvarez, N., Extremera, N., & Fernández-Berrocal, P. (2015). The relation between emotional intelligence and subjective well-being: A meta-analytic investigation. The Journal of Positive Psychology, 1-10. Sapolsky, R. M. (2002). Endocrinology of the Stress-Response. Behavioral endocrinology, 11: 409. Schutte, N. S., Malouff, J. M., Thorsteinsson, E. B., Bhullar, N., & Rooke, S. E. (2007). A meta-analytic investigation of the relationship between emotional intelligence and health. Personality and Individual Differences, 42(6), 921-933. Shevrin, H. (Ed.). (1996). Conscious and unconscious processes: Psychodynamic, cognitive, and neurophysiological convergences. Guilford Press. Skok, A., Harvey, D., & Reddihough, D. (2006). Perceived stress, perceived social support, and wellbeing among mothers of school‐aged children with cerebral palsy. Journal of Intellectual and Developmental Disability, 31(1), 53-57. Slaski, M., & Cartwright, S. (2002). Health, performance and emotional intelligence: an exploratory study of retail managers. Stress and Health, 18(2), 63-68. Smith, B., Fowler, D. G., Freeman, D., Bebbington, P., Bashforth, H., Garety, P., & Kuipers, E. (2006). Emotion and psychosis: links between depression, self-esteem, negative schematic beliefs and delusions and hallucinations. Schizophrenia research, 86(1), 181-188. Sox, H. C. (2013). Resolving the tension between population health and individual health care. JAMA, 310(18), 1933-1934. Spanos, N. P., & Gottlieb, J. (1979). Demonic possession, mesmerism, and hysteria: A social psychological perspective on their historical interrelations. Journal of abnormal psychology, 88(5), 527. Stellefson, M. (2013). The chronic care model and diabetes management in US primary care settings: a systematic review. Preventing chronic disease, 10. Strike, P. C., & Steptoe, A. (2005). Behavioral and emotional triggers of acute coronary syndromes: a systematic review and critique. Psychosomatic Medicine, 67(2), 179-186. Taylor, G. J. (2003). Somatization and conversion: distinct or overlapping constructs?. Psychodynamic Psychiatry, 31(3), 487. Tsaousis, I., & Nikolaou, I. (2005). Exploring the relationship of emotional intelligence with physical and psychological health functioning. Stress and health, 21(2), 77-86. Uchino, B. N. (2006). Social support and health: a review of physiological processes potentially underlying links to disease outcomes. Journal of behavioral medicine, 29(4), 377-387. Veenstra, G. (2000). Social capital, SES and health: an individual-level analysis. Social science & medicine, 50(5), 619-629. Wallston, B. S., Alagna, S. W., DeVellis, B. M., & DeVellis, R. F. (1983). Social support and physical health. Health psychology, 2(4), 367. Waterhouse, L. (2006). Inadequate evidence for multiple intelligences, Mozart effect, and emotional intelligence theories. Educational Psychologist, 41(4), 247-255. Webb, C. A., Schwab, Z. J., Weber, M., DelDonno, S., Kipman, M., Weiner, M. R., & Killgore, W. D. (2013). Convergent and divergent validity of integrative versus mixed model measures of emotional intelligence. Intelligence, 41(3), 149-156. Weihs, K., Fisher, L., & Baird, M. (2002). Families, health, and behavior: A section of the commissioned report by the Committee on Health and Behavior: Research, Practice, and Policy Division of Neuroscience and Behavioral Health and Division of Health Promotion and Disease Prevention Institute of Medicine, National Academy of Sciences. Families, Systems, & Health, 20(1), 7.
WHO (1948). Preamble to the Constitution of the World Health Organization as adopted by the International Health Conference, New York, 19-22 June, 1946; signed on 22 July 1946 by the representatives of 61 States (Official Records of the World Health Organization, no. 2, p. 100) and entered into force on 7 April 1948.
WHO (2014). Mental health: A state of wellbeing. Retrieved from: http://www.who.int/features/factfiles/mental_health/en/. Wood, B. L., Lim, J., Miller, B. D., Cheah, P. A., Simmens, S., Stern, T., ... & Ballow, M. (2007). Family emotional climate, depression, emotional triggering of asthma, and disease severity in pediatric asthma: Examination of pathways of effect. Journal of pediatric psychology, 32(5), 542-551. Yalcin, B. M., Karahan, T. F., Ozcelik, M., & Igde, F. A. (2008). The effects of an emotional intelligence program on the quality of life and well-being of patients with type 2 diabetes mellitus. The Diabetes Educator, 34(6), 1013-1024. Yost, C. A., & Tucker, M. L. (2000). Are effective teams more emotionally intelligent? Confirming the importance of effective communication in teams. Delta Pi Epsilon Journal, 42(2), 101. Zajonc, R. (1984). On the primacy of affect. American Psychologist, 39, 117-123. Zeidner, M., & Kaluda, I. (2008). Romantic love: What’s emotional intelligence (EI) got to do with it?. Personality and Individual Differences, 44(8), 1684-1695. Zeidner, M., Matthews, G., & Roberts, R. D. (2012). The Emotional Intelligence, Health, and Well‐Being Nexus: What Have We Learned and What Have We Missed?. Applied Psychology: Health and Well‐Being, 4(1), 1-30. Zeidner, M., Matthews, G., & Roberts, R. D. (2012). What we know about emotional intelligence: How it affects learning, work, relationships, and our mental health. MIT press. Zimmer, C. (2009, April 15). The Big Similarities & Quirky Differences between Our Left and Right Brains. Discover Magazine. Retrieved from http://discovermagazine.com/2009/may/15-big-similarities-and-quirky-differences-between-our-left-and-right-brains. Zysberg, L. (2014). Emotional intelligence, personality, and gender as factors in disordered eating patterns. Journal of health psychology, 19(8), 1035-1042. Zysberg, L. (2016). Diabetic Management and Emotional Intelligence-An Emerging Direction in Current Research. Journal of Endocrinology & Diabetes, 3(1), 1-3. Zysberg, L., & Rubanov, A. (2010). Emotional intelligence and emotional eating patterns: a new insight into the antecedents of eating disorders?. Journal of nutrition education and behavior, 42(5), 345-348. Zysberg, L., & Tell, E. (2013). Emotional Intelligence, Perceived Control, and Eating Disorders. SAGE Open, 3(3), 2158244013500285. Scholars interested in health psychology, health promotion, emotions. Students –especially graduate level students in the health sciences and behavioral sciences. The general public – individuals with basic knowledge of social science and health issues – may find the book of interest as well.